The All European Academies Madame de Staël Prize for Cultural Values is awarded to eminent scholars and intellectuals whose work represents a significant contribution to the cultural values of Europe and to the idea of European integration, thereby promoting and strengthening an understanding of Europe as multifaceted, intellectual, open and vibrant. The prize also seeks to underline the importance of non-technological scholarly work and research for European advancement. Europe is remarkable in that its definition and geographic boundaries have varied over the centuries, yet there has always been a kind of constant understanding of European culture as rooted in an inherent openness supported by a dynamic and vigorous intellectualism. In a time when the cultural diversity of Europe seems to be increasingly threatened by scepticism, extremism and instability, this prize serves to remind us of this deep-rooted and revered characteristic of Europe. Europe is remarkable in that its definition and geographic boundaries have varied over the centuries, yet there has always been a kind of constant understanding of European culture as rooted in an inherent openness supported by a dynamic and vigorous intellectualism. The Madame de Staël Prize relates to the project New Narrative for Europe, initiated by the President of the European Commission José Manuel Barroso, which invited artists, intellectuals and scientists to contribute to a reflection on the European story. In 2014, European Commission President José Manuel Barroso handed over the inaugural prize to Professor Luisa Passerini, who was honoured for her research on forms of European identity. The prize forms part of a larger set of ALLEA activities aiming not only to promote the intellectual and cultural richness of Europe, but also to support and acknowledge scholarly contributions that benefit these most valuable of Europe’s assets. Laureates are well known for their scholarly and intellectual excellence in any field in the social sciences and the humanities, including those with connections to other scientific disciplines. A laureate’s work may also be of interdisciplinary nature and must represent a major contribution to the understanding of the existing and emerging common values of Europe, and the processes behind European integration and identity. The prize counts with the support of the Compagnia di San Paolo. The Compagnia di San Paolo, founded in 1563 as a charitable brotherhood, is today one of the largest private-law foundations in Europe. It pursues aims of public interest and social use, in order to foster the civil, cultural and economic development of the community in which it operates. The Compagnia is active in the sectors of Research and Health, Art, Cultural Heritage and Activities, Cultural Innovation, Social Policies, and Philanthropy. Read more about Compagnia di San Paolo here. The prize was kindly co-sponsored by Stiftung Mercator until 2016. Stiftung Mercator is a private foundation which fosters science and the humanities, education and international understanding. It specifically initiates, develops and funds projects and partner organisations in the thematic fields to which it is committed: it wants to strengthen Europe, improve integration through equal educational opportunities for everyone, drive forward the energy transition as a trigger for global climate change mitigation and firmly anchor cultural education in schools. Stiftung Mercator feels a strong sense of loyalty to the Ruhr region, the home of the founding family and the foundation’s headquarters. Read more about Stiftung Mercator here. 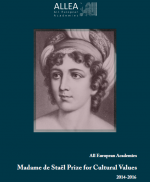 The ALLEA book “Madame de Staël Prize for Cultural Values 2014-2016” honours the first three recipients of the Madame de Staël Prize, Luisa Passerini, Dame Helen Wallace, and Rémi Brague, and preserves written testimony of these personalities and their words. It comprises the lectures of the three laureates as well as the three respective laudatory speeches. Furthermore, it reproduces the speeches of the three distinguished EU high level officials that subsequently participated in the award ceremonies: former President of the European Commission, José Manuel Barroso; European Commissioner for Research, Science and Innovation, Carlos Moedas; and European Commissioner for Neighbourhood Policy and Enlargement Negotiations, Johannes Hahn. 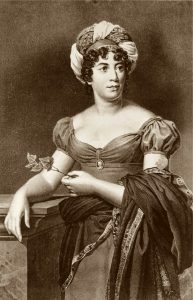 Download the Madame de Staël Prize book here.